The Right Honourable Theresa May, PC, MP Home Secretary and the Member of Parliament for Maidenhead has had placed on her desk papers which relate to a decision the effects of which are common for those holding high office. This is the damned if you do or damned if you don’t scenario, or to use the phrase our friends in the USA have invented, she is faced with a No Win Situation. 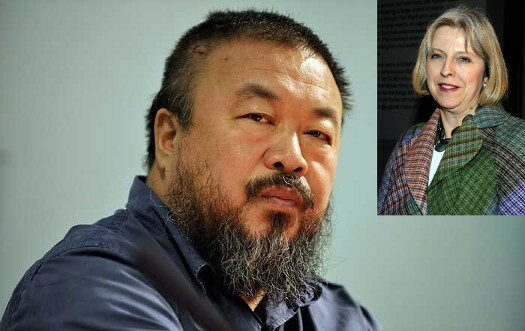 This predicament concerns the travel arrangements of a certain Mr Ai Weiwei, a Chinese artist who has incurred the wrath of the Communist Party of the People’s Republic of China by having the effrontery to criticise government policy! It is of course perfectly clear to any sentient creature with at least two functioning brain cells, what has happened. A civil servant has rigorously applied the rule book (something the British Civil Service could win a World Championship in, were the World to stage such) to ensure that Mr Weiwei will have left the UK by the time President Xi Jinping arrives for a state visit in October. Let us be in NO DOUBT WHATSOEVER of the consequences of Mrs May upholding this overly bureaucratic decision on the part of a “minor functionary.” The government of China, AKA the bosses of the Communist Party, will regard the ensured absence of Mr Weiwei in the UK during the state visit as a VERY COURTEOUS GESTURE. Upholding such a gesture will pay VERY HANDSOME DIVIDENDS to British businesses and their employees. Equally, upholding this gesture will involve a POLITICAL COST to Mrs May and the Conservative government. They will be taken to task by the opposition amongst others. Mrs Harriet Harman will be highly delighted to be handed a stick with which to beat the government – especially in the light of her own travails with a certain Mr Corbyn! You Dear Reader may well expect the British Gazette to advocate the government to uphold it’s democratic principals and allow this perfectly respectable Chinese gentleman to stay in the UK as long as he wishes. Let us repeat this: Mr Ai Weiwei is a perfectly respectable Chinese gentleman. - This country prospers through TRADE. No trade, no prosperity. Which means little profits, little tax revenue and little public spending – aka austerity. - China – recent downturn notwithstanding – is a MAJOR market VITAL for British industry and the size of this market will INCREASE as the population of China gets wealthier. - The above two FACTS are true whether the UK is IN or OUT of the EU. It is your Editor’s opinion that Mrs May should uphold the civil servant’s decision and endure the chastisement which will surely follow. She should comfort herself that the greater the censure from such as Mrs Harman the GREATER will be the esteem with which the Chinese rulers will hold the British government and the greater the rewards to British business. You may think that such as Mr Weiwei’s travel arrangements constitute a minor matter that statesmen do not trouble themselves with. This is however to misunderstand the Chinese mind. The Chinese have – and we are not just referring to the present generation of Communists but all previous generations of Chinese rulers – attached VERY great significance to such gestures. Mrs May should comfort herself that any criticism she and the government receives will soon be forgotten by the opposition and the chattering Guardian reading classes, but the business brought about will be long lasting. In a nutshell: Beggar’s can’t be choosers! We need the money! Many of us who have been employed as salespeople have had to smile and entertain people we despise, but keeping our job meant doing our job and closing that sale!